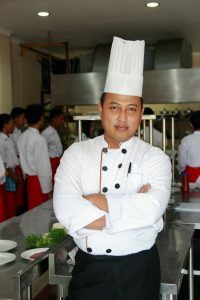 Chef yang baik hati dan tidak sombong “Celebrity Chef”, He was born in Surabaya, East Java Province, Indonesia in 1972 to position the first son in the family member and the only one of these families who choosed the world of cooking as a hobby, passion and professions. Extending from the hotel, catering at home, the jury in culinary competitions, artisans call the caterer and cooking instructor. Cooking for him is the breath of life. Cooked like a plucked guitar or like smokers are addicted. “There should be spelled death to my cooking.” That’s why cooking is finally morphed from the original hobby into a living. “Because I can’t cook if you do not eat”. If there are activities outside of cooking that is also occupied, is playing computer games or playing Play Station. I write here is in accordance with my experiences during work in the hotelier industrialized since 1993 until 2011. After that I teach and provide training to private parties as well as government agencies. Even though I‘ve had outside of the hotelier industrialized, I keep learning to keep of developments in the pastry bakery and food production.